It's New Year's Day, 2101. Somehow, humanity survived the worst of global warming—the higher temperatures and sea levels and the more intense droughts and storms—and succeeded in stabilizing the Earth's climate. Greenhouse gas concentrations are peaking and are expected to drift downward in the 22nd century. The rise in global temperatures is slowing and the natural world is gradually healing. The social contract largely held. And humanity as a whole is better fed, healthier, and more prosperous today than it was a century ago. This scenario of an imagined future raises a key question: What must we do in the 21st century to make such a future possible, and to head off the kind of climate catastrophe that many scientists now see as likely? 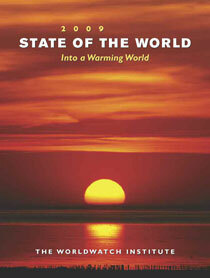 This question inspires the theme of the Worldwatch Institute's State of the World 2009 report: how climate change will play out over the coming century, and what steps we most urgently need to take now.